The Delta! Yes, I dusted it off, figuratively speaking, and popped it in the pram along with the black Dopero. With an extra length of blue tail in my pocket, Aren and I headed out to the Old Reynella Reserve. The breeze was occasionally fresh and blowing from the East. After a few short flights it seemed the Delta would be happier with more tail in the gusty breeze. The next time it force landed (!) I went out and tied on the extra meter or so of tail. Soon the clear plastic and bamboo delta was sailing high above the reserve, moving between about 45 and 60 degree line angles. Occasionally, with the help of warm rising air, it went almost directly overhead, before cruising around like a glider, down to lower altitudes. The air was quite rough at times, jerking the kite suddenly in various directions and sending pulses down the flying line. The kite did get forced down a number of times since the gusts became increasingly strong. Each time however, it was easy to re-launch just by carefully dragging the kite along the grass and into the air. I just have to mention a couple of bird-kite encounters! A fast little bird came through and took an interest in the kite. It circled numerous times, within a few meters of the kite. Its stumpy, elliptical wings beat quickly as it darted around, sometimes above the delta and sometimes below. It was about the size of a sparrow. Finally the bird flew off. At another time, a small flock of pink-crested galahs came through, below tree height. A couple of them almost collided with the flying line! Aren had a turn flying the delta while I had my foot on the winder, on the ground beside the pram. At the age of 2, he can't be trusted to hang on for too long! After a while I decided to try and get some photos, so I brought the kite down to about twice tree top height and took a couple of shots. Since the little delta was floating around quite comfortably, I also took a half minute or so of video. With nearly full zoom, the kite plus its tail filled about half the field of view as I panned around following its every move. After this we put the Dopero up for a while. It too, wanted some more tail in the fresher gusts, so I gave up after a while and packed it away. In any case, the sun was pretty low in the sky, and other duties called. The first of the 2-skewer kites is here! The new standard is orange garden bag sails and black garbage bag tails. This combination really stands out against a blue and white sky! 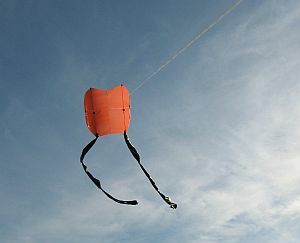 The proportions of this sled kite are identical to the MBK Skewer Sled kite which is the very first MBK kite in the series. The breeze down at the reserve near the school was very light and variable. In fact, only when a gust came through was it possible to get the sled in the air. I was a little concerned that the heavier sail plastic might make this sled a poor light wind performer. However, after getting it 10 or 15 meters in the air a couple of times, it seems that it's light wind performance will be 'fair'. Can't wait to fly the 2-skewer sled in a moderate breeze! With more breeze, it might also be more comfortable with an extra loop of tail on both sides. In today's light air, it seemed reasonably stable. In theory, this kite pulls 4 times as hard as the single-skewer version, and it felt like it too! Even so, the 20 pound flying line should be adequate in moderate breezes. I hope. We'll see! We took a few photos, including the one at the top of this post, and even some video to mark the occasion. Well, not quite, but ho boy... what this kite did today just... errrm... blew me away! Aren and I went down to the Old Reynella reserve, our most frequently visited flying field, with the new MBK 2-Skewer Sled kite rolled up and stashed in the bottom of the pram. On arriving, it was clear that there would be enough wind, but it was very gusty. Quite typical for this location. After a few attempts marred by rough air flowing behind the bushes and trees, the big orange rectangle took to the sky in spectacular fashion. It really looked 'like a bought one' with its neat black spar caps, bright orange sail and twin black garbage-bag tails. This sled pulls like a horse compared to any of the single-skewer designs! Ok, how did it fly? Two things became obvious fairly quickly. Firstly, this kite is quite prone to collapsing when flying in the slightest patch of rough air. Several times, it folded up completely before dropping almost to the ground and then re-inflating. A little working of the flying line would help it get back into shape, before it rocketed back up again. At other times, the top edges of the side flaps would briefly and noisily collapse, before filling tight with air again. The kite would drop several meters every time this happened. Secondly, and this completely makes up for the first point, I was just amazed at the sheer performance of this bog-standard sled design! The wind strength increased quite a bit while we were flying, but before it got too strong, it was clear this kite could sustain around a 60 degree flying line angle! I haven't seen a lot of sleds fly, but I believe this is rather good for a simple single-surface sled. During the entire time we were flying, it spent most of its time between about 45 and 65 degrees from the horizontal. With a little thermal help, it might have even made around 70-75 degrees at one point. It's much easier to be accurate when making a kite of this size too. This was evident since the kite stayed stable with just 6 skewer-lengths or so of tail on each side, despite the fresh breeze. Finally, however, a really strong gust caused the flying line to go straight as a plumb-line, and let out an ominous high-pitched buzz. The poor sled went round in a large loop to the right, a 360. How something didn't break or pull out I don't know. Am I pleased with this kite? You bet! If you want to make it, be careful in windy conditions. The pull will be too much for a very young child to manage. Also, you will need to carefully avoid letting the line slip through your fingers, unless you are wearing a protective glove. It's hard to believe that just 4 slim bamboo skewers and some plastic fastened with electrical tape can have so much grunt! There was a bit of movement in the trees and bushes outside, so Aren and I got in the car and drove down to the reserve near the school. Optimistically, I had brought the 2-skewer sled plus the latest MBK delta in case the breeze wasn't enough for the sled. As well, we brought the 50 meter test line and a much longer line on one of those shop-bought red plastic reels. Actually, the reel came with the original length of Dacron line we purchased from the local kite shop. Well, conditions must have been dying rapidly, because by the time I got out of the car and got Aren into his pram, there was no real breeze. The sled kite stayed in the car as we headed out to do some ultra-light-wind delta flying! Initially, the hope was that there would be at least enough in the occasional gusts to get the delta high. It's not a bad little light wind flier. Once up, it can hang in quite a light breeze. The delta was using a short tail, in an effort to get the maximum performance out of it. This of course made it less stable and trickier to fly down low. So I started yanking the line at just the right moment, as it looped from side to side, to shoot it straight up and gain a bit of height. A bit like those Indian fighter kites that only fly straight with extra tension in the line. This technique allowed me to gain much more height when there were a few seconds of breeze. It gradually became clear that there was a connection between the sun coming out from behind the moving clouds and the gusts moving through. Thermals! Sure enough, on one occasion I managed to climb the little delta almost straight up for maybe 10 to 15 meters or so. Very small-scale stuff, mind you, working these tiny bubbles of warm air so low to the ground. But they do exist! I can remember losing a model glider once, in a low thermal. It was circling down, after being towed up to a modest height, maybe 20 meters or so. Then it came round again, but no lower than the previous time. Them it started gaining height on each circle! Minutes later, my Dad and I watched it disappear downwind in the distance, still climbing! And no, it wasn't radio controlled, so I couldn't just fly it back. This was back in the 70s. So we missed out on seeing the 2-skewer sled go really high today. On the other hand, it was an interesting flying experience with the small delta. The 2-skewer delta, which is due to be made in a few months time, will be even more fun in zero-wind sunny weather!